We’re gearing up for our 2012 “Best” lists – the best charge cards, the best cash rewards cards, the best cards from each credit card company – and there’s one category we’re really looking forward to. This year, we’re going to review the best credit card company commercials. Everyone has their favorites, right? Jimmy Fallon, Alec Baldwin, Chevy Chase (bet you can’t figure out which card company Chevy Chase endorsed) and other TV celebrities all play a role, too. This year, there’s no shortage of whimsical, funny, poignant – and even goofy – credit card commercials. Make no mistake the card companies and their advertising agencies are brilliant – they choose what works and what we’re left with is plenty of fun commercials and an idea that we can’t live without the credit card. So, as we’re gearing up for the “Best Of” season of sorts, we thought we’d break it down and take a look at a few of the great commercials from each company – with the goal of culminating them into the best of the best. 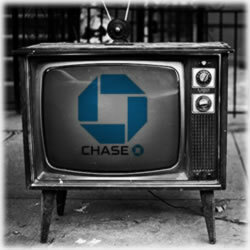 This week, we take a look at Chase credit card commercials. From the fantastic Super Bowl ad that still has folks buzzing to the unique black and white Chase Sapphire commercial with “The Boys Are Back in Town” playing in the background, Chase raised the bar – and we wouldn’t expect anything less from the banking giant. And by the way – be sure to let us know your favorite, too – we’ve not declared our own winners yet, so if we missed something or if you were inspired by any of these – give us a heads up! Up first is the aforementioned Chase Sapphire Preferred commercial with Dad and his two young sons out for lunch together. The catch is “Not every meal is about food”. It’s classic – it speaks of family, and while its focus is on money and credit, the corner diner is perfect – not too pretentious and it’s believable (really, how many of us are going to take our two boys on a Saturday afternoon for lunch in some regal restaurant?). Milkshakes, burgers and time well spent. We say this is 32 seconds of our time well spent, too. It’s the feel good Chase Commercial of the year. The classic “The Boys are Back in Town” by Irish rockers Thin Lizzy is the perfect accompaniment too. You’ll be craving a Chase Sapphire preferred, an afternoon with the little ones – and a milkshake, too. Next up, we take a look at the Chase Freedom “Cash Back Footloose” commercial. Now, in all honesty, this wasn’t one of our favorites. I love the classic music that’s become popular in many of today’s contemporary commercials, but please – give me the originals. Still, the sweet hound dog in this commercial, another sepia toned but with the classic blue shadings, redeems the commercial in its entirety. It’s not Kenny Loggins, but it’s not bad either. Ben Grant makes it count – and the cash back examples shown in the ad are great, too. Of course, no “Best of” list is complete without the adorable Drew Brees commercial that debuted during this year’s Super Bowl. Let’s face it – Chase scored huge when it landed Drew Brees. It was a home run (I know….I know…touchdown is a better word), but it it gave us everything a television commercial should be – plenty of product placement that’s in use, a great sports figure, sweet kids and the power of technology. It just doesn’t get any better than that, right? 2005 was the year of sentimentality for JPMorgan Chase. There were two tear-jerker commercials, both involving how quickly time slips away. In this first one, we watch a family evolve and the jist of the commercial was the 90 Chase credit cards that applicable at every stage of our life. The “100 Years” tune by Five for Fighting is playing in the background as Mom and Dad walk down the aisle, begin their family and then see that family grow to include grandchildren. It’s a classic favorite – and it definitely served its purpose. You see several of the co-branded cards, including the Disney – Chase card, as well as the Amazon – Chase card. There’s simply no denying the power of the television commercial. When they’re done right, they are powerful marketing tools and money makers for the companies the commercials showcase. The credit card companies have truly honed in on what the American consumer is looking for – and what he needs. While we’re showcasing JPMorgan Chase in this post, be sure to check back as we tackle the other big credit card game changers, including Capital One – everyone loves Jimmy Fallon, right? We also take a look at one we actually didn’t like (gasp) from Citi. All we’ll say at this point is the commercial has an awesome tune and it includes rock climbing. The reason might surprise you, too. So what are your favorite commercials from credit card companies? Have any that work because of the classic rock or beautiful lyrical pieces? Maybe it’s a great actor at the helm that makes it work for you? What ever it is (or isn’t), let us know – we want all the input we can get as we embark on this end of year tradition. Leave us a comment, tweet us or leave us a post on Facebook. I want to know where the diner from the Chase Sapphire Preferred commercial is, so that I an avoid it at all costs. Burgers, shakes, and fries for three people costs $65 there!